The seemingly easy question gets a little murky when you start looking for neat definitions of exactly what tartan is. I found some notes I wrote years ago and thought I should share them. What does the word ‘tartan’ mean? Some writers give the origin of the word as French ‘tiretane’, though this may simply refer to a kind of material of French origin. Others say the first mention of tartan is in the Exchequer Roles of the Lord Treasurer of the Scottish court of King James V in 1538 where there is an order for a bale of cloth of ‘Heland Tartane’, the material being used for ‘hoiss to the the Kingis Grace’ – perhaps a new pair of tartan trews for the King. However, some writers argue that this still refers to material of French origin (ie tiretane) and that the ‘Heland’ part simply indicates the cut of the finished garment. Even more mysterious is the fact that tartan is an English (or Scots) word in any case and that the word for striped cloth in Gaelic is usually breacan (cf Gaelic breac – piebald or spotted). OK, got that? Way back, when I wrote about tartan, you'll be glad I missed out on a lot of other etymology that may take the word back to tyrius, Latin, cloth from Tyre, and also to Old French tartarin or Tartar cloth. In addition, when Johanna used to guide visitors from the USA, they often asked her if tartan was the same as plaid. Anyway, there is a Gaelic word, plaide, meaning a blanket, though Chambers Dictionary comments that it may be from the Scots (or Engish) word. There is a link to Latin pellis, meaning a sheepskin. Enough already. (Pictured here) Tartan is the de rigeur outfit for a pipe band. This one is the Dufftown and District Pipe band, parading along the main street of Aberlour, Moray. In earliest times, local families or settlements in the Highlands made their native cloth with colours derived from locally available dyestuffs. Traditionally, to help the cloth take the chosen colour, ‘mordants’ were used, eg, alum, iron, copper, urine, fir club moss or oak galls. Dyes were obtained from several species of mosses, as well as plants like bilberry, devil’s bit scabious, elderberry, (blue), yellow iris, (blue grey), ladies bedstraw, blackthorn (red), crowberry, bramble, elder, sundew, St John’s wort (purple), bog myrtle, bird’s foot trefoil, heather, birch (yellow), water lily (black). The Edinburgh Military Tattoo - it's a total tartan-fest. 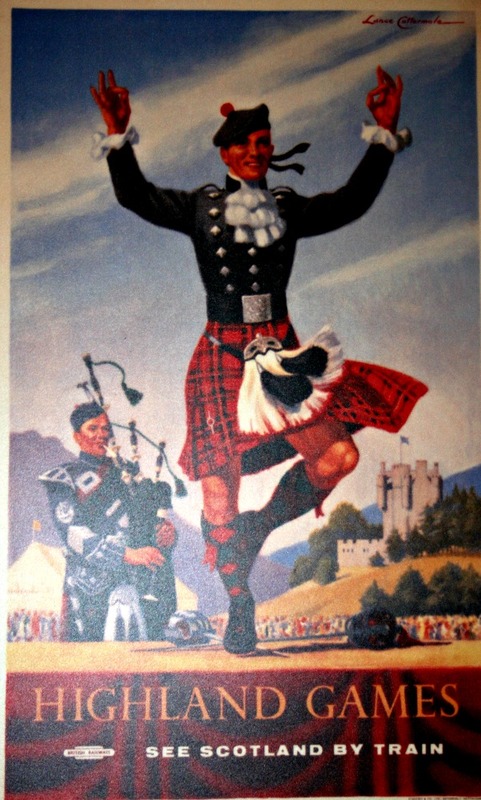 (Pictured here) Where would the Edinburgh Military Tattoo be without the spectacle of tartan? It’s also a reminder of the role that the military played in making tartan ‘respectable’. Historically, there is no evidence to suggest that the old clans could be distinguished one from another by tartan alone. So if you ask what is tartan, the answer may not truly be a way that clans identified each other in times long ago. The availability of local dyestuffs would dictate the colours in the finished cloth. At the Battle of Culloden in 1746, Hanoverian government clans (ie Highlanders not on the rebel side but in the regular army) were distinguishable from the rebel Jacobite clans only by colour of badges on bonnets – red or yellow for government, ‘white cockade’ for Jacobites. Tartans are not like heraldry with its limited entitlement to display certain patterns. It is often related as part of the story of tartan that wearing it was banned by Act of Parliament in the British Government’s ‘clampdown’ following the defeat of Bonnie Prince Charlie and his rebel army. The British Army was the first to set down or define uniform tartans in the eighteenth century. Then King George IV’s visit to Edinburgh 1822 helped popularise tartan, with new designs being introduced as demand increased. Around this time in particular, many popular tartans were designed or otherwise invented as fashion dictated and the process continues today when an occasion merits it. So another definition of tartan is that it was a poor peasant cloth that later developed huge commercial potential. Tartan as visual cliché. Advertising material for the railways. The works of Sir Walter Scott, then Queen Victoria’s love of Scotland, continued to ensure tartan’s popularity. Today, of course, in a strictly legal sense, visitors can wear whatever they choose, though it is fun to make a connection to an old clan. Several manufacturers and mill, gift, or woollen shops will help on the spot. District or general tartans, eg Caledonian, Jacobite, Culloden, Fort William are also available, should there be any difficulty in finding a distinct clan connection. (Pictured here) Tartan as visual cliché. Advertising material for the railways. So just relax about it and wear what you like. You won’t be locked up by the tartan police. If you can trace a Scottish connection then that’s fine. Personally, as a native Scot who can trace his ancestors back to generations of dirt-poor fisher-folk who never wore a kilt in their lives, I think the whole tartan dressing-up thing might be great fun and a brilliant way of expressing your link to or affection for Scotland. The point is that one way of looking at tartan is simply as brilliant packaging for Scotland – it’s both iconic and ironic. Firstly because the pattern is recognised as Scottish right across the world: and secondly, because it was originally only the cloth of an oppressed and now scattered race, the Highlanders of Scotland. It was even banned by Act of Parliament after the end of the Jacobite uprising in 1746, the ban remaining in place till 1782. Ironic – but pleasing – that it now stands for the whole Scottish nation. What is tartan? It’s a packaging for all kinds of tasteless Scottish tat. Combined with Nessie, as in the picture here, we almost reach icon overload, though in this instance we remain some distance from good taste. So, tartan is a packaging for all kinds of tasteless Scottish tat as well! There are surprisingly few references to this nifty bit of math. I even wondered if I’d made it up. No, it will have come from one of the published histories of tartan. Basic algebra is woven into tartan cloth. A weaver can work out the total number of shades (including solid colours) that will result from using a given number of colours of thread by using the formula (t + 1) x t x .5. [Or t plus 1, times t, all divided by 2] where t is the number of colours available. Thus 3 colours give (4 x 3) divided by 2, ie 6 shades, while 4 colours give (5 x 4) divided by 2, ie 10 shades, and so on. Phew!